The latest arrival is 3 PM and you will have up to 5 PM to complete your painting. 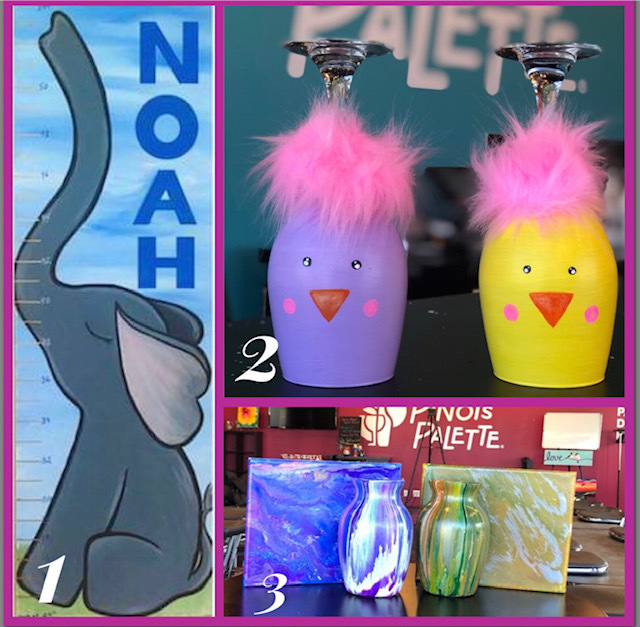 Choose one 16x20 canvas, two 8x10 canvases, or two stemless wine glasses. Unlike our traditional step-by-step instructor-led art class with an art instructor on stage, Open Studio time is designed to give you more flexibility and freedom. This is your chance to decide what you'd like to paint! (Each option includes all the supplies you need to complete a painting within a 2-hour time slot). Select from numerous paint designs, and then with the help of self-guided instructions, complete your painting within a 2-hour time slot. Option 3) Be the Artist. We'll provide everything you need for a fun day out: the brushes, the paints, apron, music, then sit down with some music and start to paint from your imagination... Have an idea in your head, this is the time to paint it into reality. We have several self-guided paintings to choose from. There will be artists available to assist you.